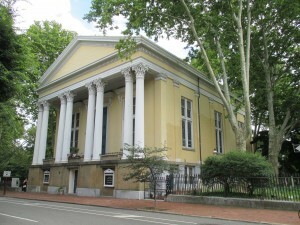 St. Peter’s Episcopal Church, founded 1791. What were the dangers and difficulties in the Old World (Europe) that led to William Penn’s desire to provide a haven with religious freedom and freedom of conscience? What impact did the Reformation have on the settlement of the young America? 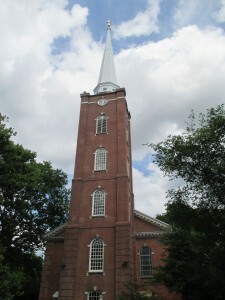 Join us on a visit to the oldest Quaker, Episcopal and Methodist churches in Pennsylvania and explore their history from 1682 through the early years of the young republic, the United States of America. Let us introduce you to men and women, very well known in their own day, who were instrumental in laying the foundations of our Legacy of Liberty and Faith. Explore with us the lives, faith, and friendships of patriot founders at Old Pine St. Presbyterian and St. Peter’s Episcopal Churches. Visit the Presbyterian Historical Society to trace Presbyterian history in Philadelphia and America and to see the lovely reproductions of the “storied” fireplace of John Witherspoon’s childhood home. Learn about George Duffield, the fiery Revolutionary era minister at Old Pine and one of General Washington’s chaplains. Tour the cemetery at Old Pine where over 285 Revolutionary War soldiers are buried alongside many other worthies.